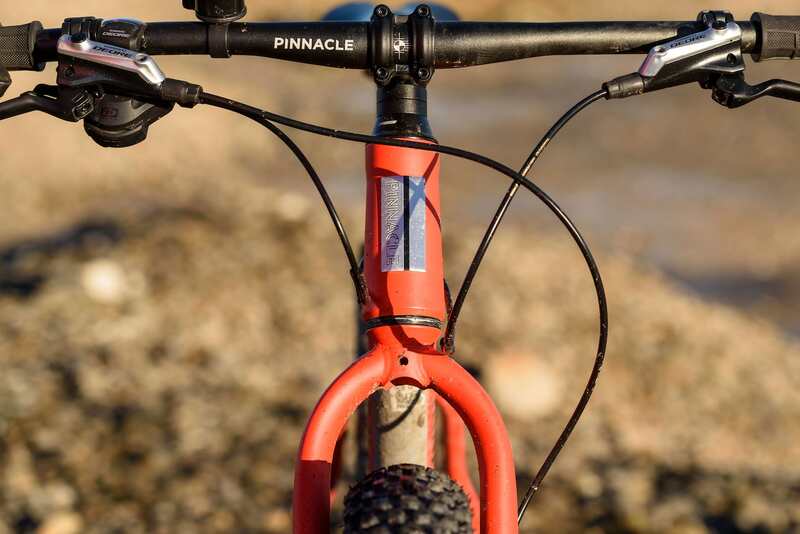 Pinnacle is the house-brand of retail giant, Evans Cycles, but the range is way more than a selection of rebadged catalogue bikes. The brand’s bike designer James Olsen has a long pedigree in the UK bike industry and is one of those designers who likes to really practice what he preaches, with various Pinnacle bikes being put to the test on an epic camping trip to Nepal, or ultra road rides from London to the Eurobike show in Germany. 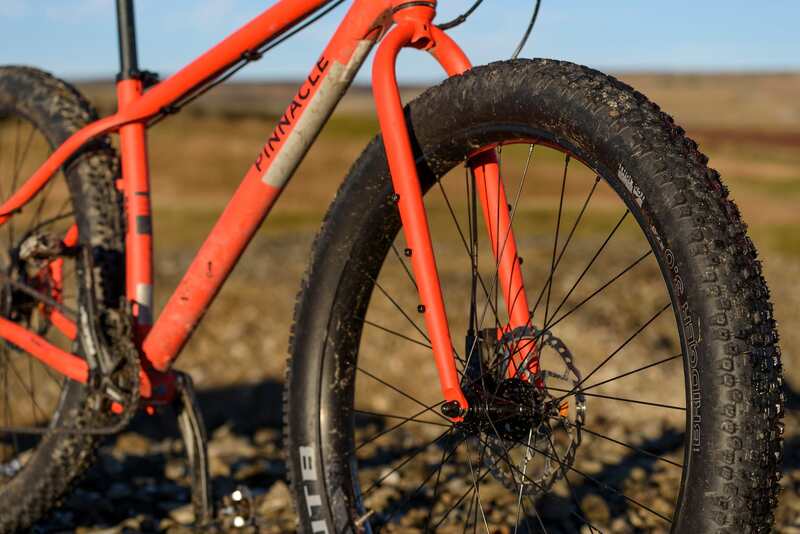 The Ramin comes from Evans Cycles’ own brand, Pinnacle. 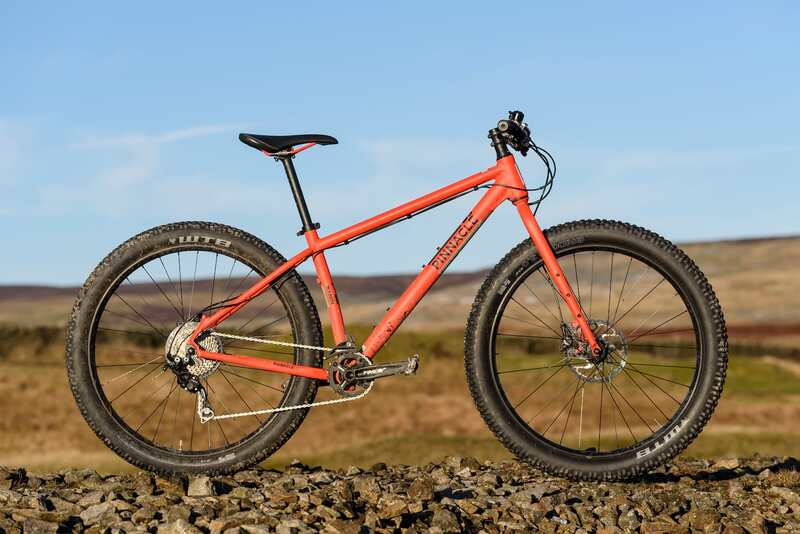 The Ramin range starts with the Ramin 1, a 1×9 fully rigid 29er that can be bought for less than £600. 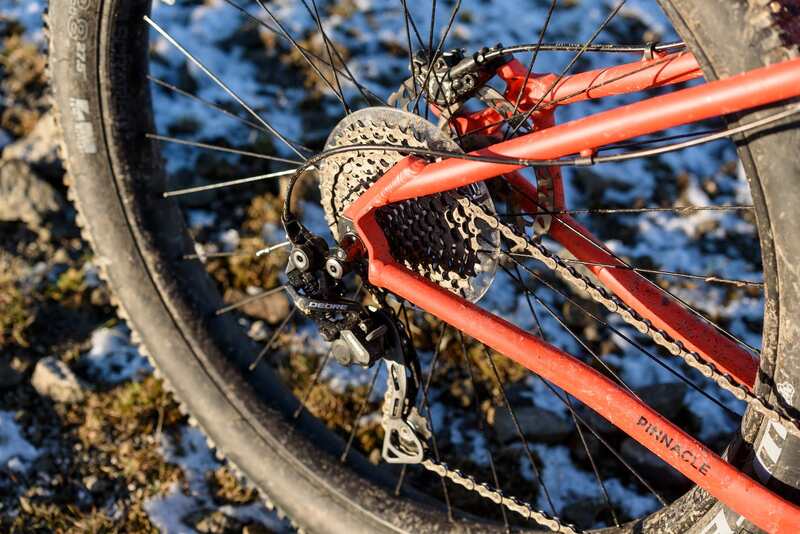 The Ramin 2 adds a suspension fork, but it’s the Ramin 3 that seems to have attracted all of the interest. Coming well under the magic Bike to Work threshold, it offers a versatile, fully rigid machine that can be put to many uses. While all of the bikes in the range can accept plus tyres, the Ramin 3 Plus, as the name suggests is specced with them from the off. It also has a trick up its sleeve in the form of an eccentric bottom bracket shell. 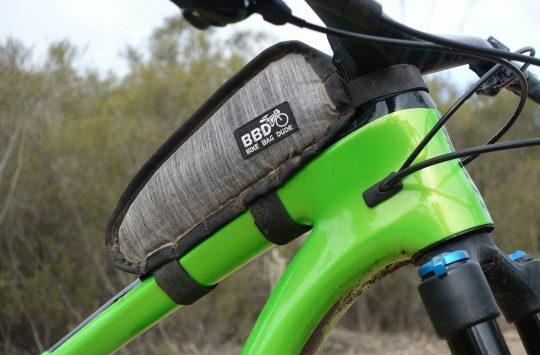 This means that the bike’s bottom bracket can be adjusted for running 29er wheels, or used to take up the slack if you’re running the bike singlespeed (or hub geared…). 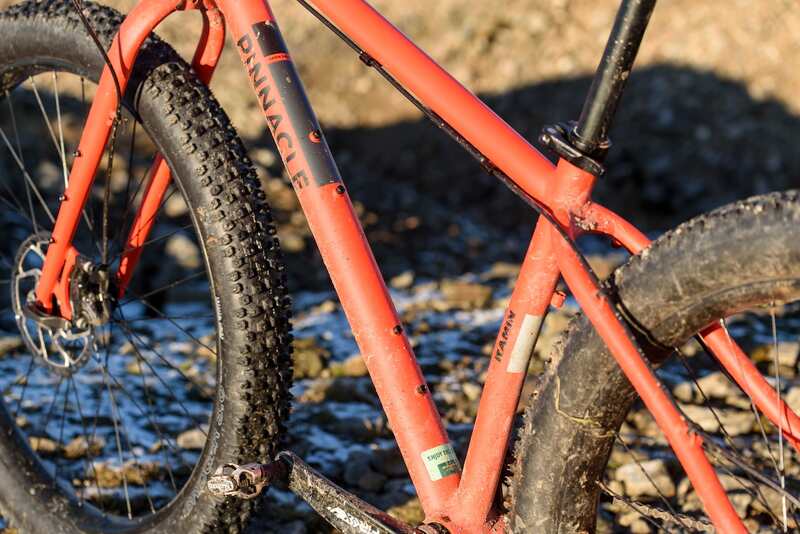 The Ramin 3 combines an alloy frame with a rigid fork and disc brakes. In order to further keep costs low and add to its versatility, the bike’s frame spacing is non-Boost in order to make it more compatible with bits and pieces you’ve probably got left over in your shed. You can even add a suspension fork (up to 120mm) if you fancy, without unduly affecting the handling. 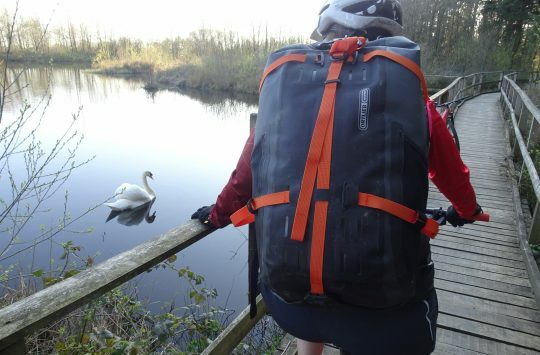 All of this versatility has made the 3 Plus an underground hit with the UK bikepacking community as well as riders who either want a versatile spare bike for winter use, or for riders who simply want one bike that’ll do most things. It’s a good-looking bike for the money, but also the lightest on test. The heart of the whole Ramin range is a 6061 T6 double-butted aluminium alloy frame. In this case, it’s a pleasing dusky satin orangey colour. There’s a steel fork and a load of braze ons on both frame and fork. The frame hosts TWO sets of bottle bosses on the downtube (and another underneath, though none on the seat tube), and the elegant cromoly steel forks get two lots of triple bosses – de rigeur in bikepacking circles for Salsa Anything cages (or King ManyThing cages or Blackburn’s Cargo cage and similar contraptions for carrying loads). Fork zits for bolting on gear for your next bikepacking adventure. 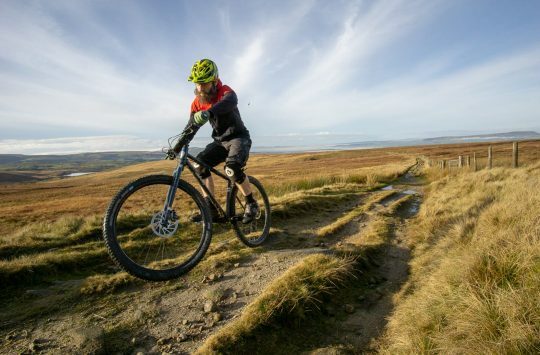 The bike features plus-sized 27.5in wheels, with trusted ‘weighty but wide’ WTB Scraper rims and a great tyre combo of a grippy WTB Bridger 3in tyre up front and a faster rolling Trailblazer 2.8in out back. Both tyres and rims are tubeless ready and it took all of ten minutes and a pair of valves to get them aired up and ready for the lower pressures that plus tyres can (and should) be run at for maximum off-road grip. Shimano Deore 1×10 drivetrain is solid and reliable. Elsewhere, there’s a pretty sorted spec on the bike that once again reinforces its ‘jack of all trades’ reputation. The transmission features the kind of unholy alliance of brands that tends to come with bikes at this price range (and which generally get along just fine). In this case, a 32T SRAM Fire-X chainset drives a KMC chain over ten Shimano sprockets in an 11-36T range. 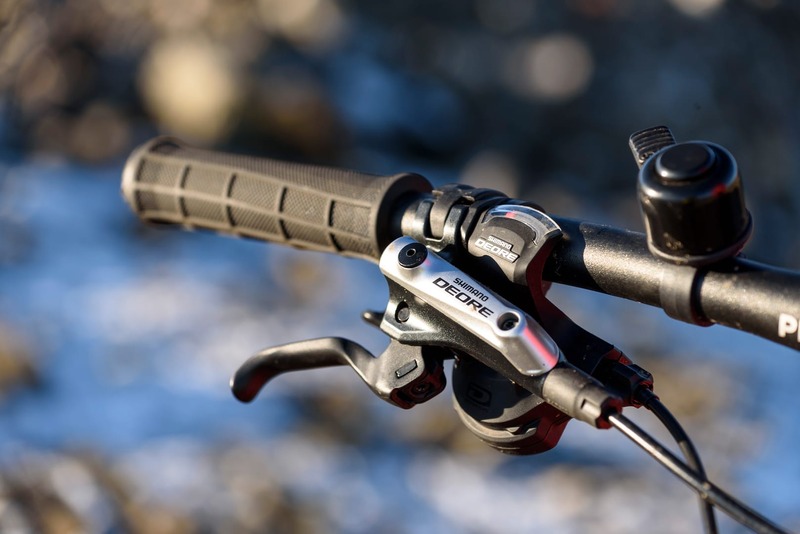 A Shimano Deore shifter and rear mech wafts the gears around in a perfectly serviceable manner, while a reasonably redundant chain device keeps the chain on. While a bigger gear range would have been welcome, a 36T is the theoretical lowest gear for the rear mech. No doubt a bit of tweaking of limit and tension screws will let you get an aftermarket expander in there for a bit of a drop in shifting fidelity. Likewise, the Deore disc brakes are top performers. Brakes are Shimano’s Deore M615 (i.e. the previous generation of Deore) with 180/160mm rotors and they’re a joy to use. Lovely levers and plenty enough power for the kind of trouble you’re going to get yourself into with a rigid fork up front. The hubs are simple quick release Joytech sealed bearing jobs, but they can be converted to thru-axles front and rear if you’re on an upgrade rampage. The 60mm in-house stem and 720mm bars are fine, though we found the Kraton rubber grips to be rather hard and wandery on bumpier descents. Probably candidates for the first bit of upgrading. The saddle and 27.2 seatpost are pretty run of the mill items, but proved to be comfy enough for longer rides. The addition of a seatpost quick release allows for a bit of radness for descents if you’re that way inclined and the Ramin features a long seatpost shim that can be removed to reveal a 31.6mm seat tube and plumbing ready for that upgrade to a dropper post. 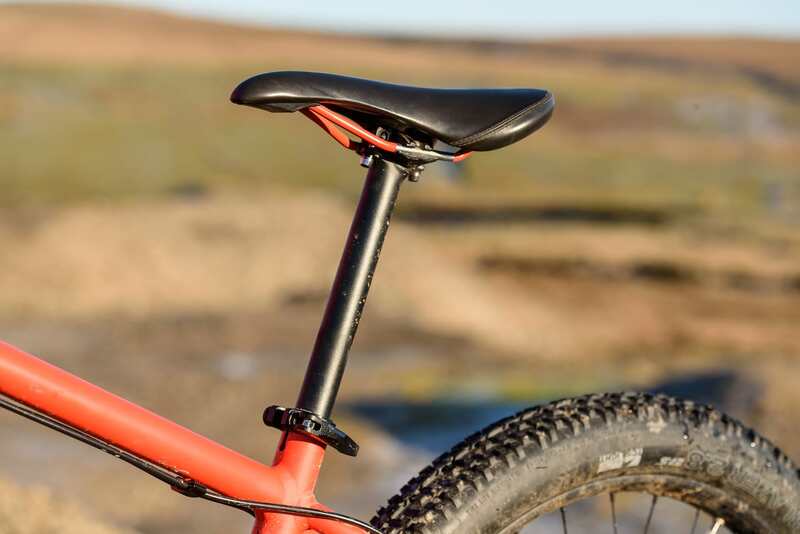 There’s a QR seat clamp for easy on-trail adjustments, but the Ramin frame will take a dropper if you decide to upgrade. I love mine. It’s like my original 1986 Rockhopper with most of the beneficial developments that have happened in the last 30 years but without anything that adds more maintenance or cost of ownership. I did swap out the 11-36 cassette for an 11-42 which helps on the climbs and put a narrow wide ring on the front so I could lose the chain guard. Might not suit someone who’s always ridden with suspension but if you started in the days when everything was rigid this is a perfect way to feel 30 years younger without being beaten up to the point where you feel 30 years older. Where’s the top riding pic (by the wall, hill in the background)?